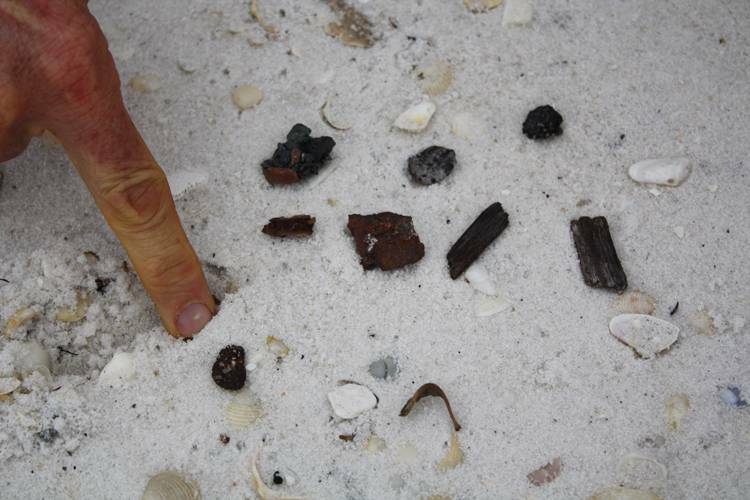 As part of ongoing research nearly four years after the Deepwater Horizon oil spill, scientists from the Woods Hole Oceanographic Institution (WHOI) will team up with a group of high school students in Florida to collect remnants of oil from Gulf Coast beaches this week. Marine chemist Chris Reddy studies how the many compounds that compose petroleum hydrocarbon, or oil, behave and change over time after an oil spill. He and his researchers have collected and analyzed about 1,000 oil samples from the Gulf Coast since the Deepwater Horizon oil spill. "With an iconic and wide-ranging spill like Deepwater Horizon, the need to perform such long-term studies is a top priority for me," said Reddy. He has already catalogued many of these samples in an on-line database to make the data available to the public and scientific community. How the compounds react and weather in the environment also can help inform the chemical industry, governments, and clean-up efforts when future oil spills occur. "Spilled oil undergoes a series of changes due to Mother Nature called 'weathering.' Weathering differs from one site to another based on several factors including the type of oil spilled and the local climate. Therefore, each location is a living laboratory that allows us to interrogate how Nature responds to these uninvited hydrocarbons." On Feb. 28, the group of students will work alongside Reddy’s team and colleagues from the Florida State University in one such living laboratory at a Pensacola, Fla. beach. 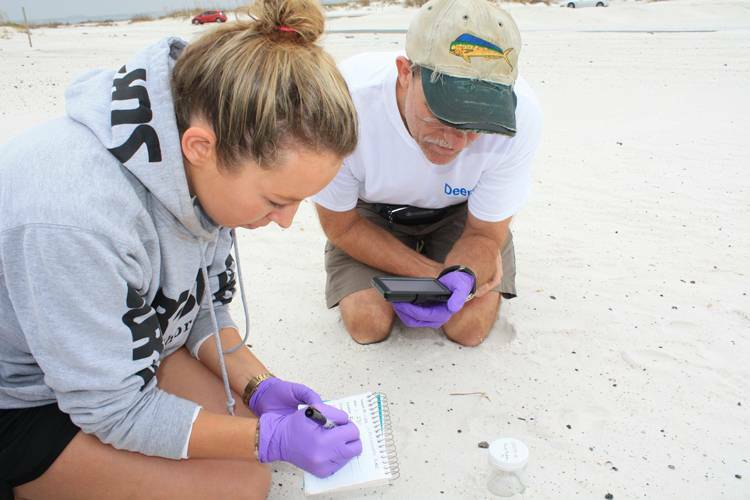 This field expedition is part of a new education initiative called the Gulf Oil Observers (GOO), which trains volunteers to be effective citizen scientists. GOO mentors are educators and scientists associated with the Deep-C Consortium research project – a long-term study investigating the environmental consequences of oil released in the deep Gulf on living marine resources and ecosystem health. The students from West Florida High School of Advanced Technology in Pensacola will collect samples of small, round clumps of sand mixed with crude oil. These oiled sand patties can be easily overlooked on the beach. No bigger than a silver dollar, they resemble small dark rocks, driftwood, and other beach debris. "But if you know what to look for, they’re not difficult to identify," said Reddy. That’s why he and WHOI researcher Catherine Carmichael will train 23 high school students, the first group of GOO volunteers, on-site in Pensacola, Fla. to help conduct this research. "The nature of our research – investigating the issues involved in understanding and protecting ecological communities in the Gulf – provides rich opportunities for engagement with teachers, students, and the general public," said Eric Chassignet, professor of oceanography at the Florida State University and director of the Deep-C Consortium. Before going out into the field, the GOO volunteers participated in a series of classroom lessons led by Florida State University educators that covered topics including how to think like a scientist, applying the scientific method, the effectiveness of oil‐eating microbes, and information about the Deepwater Horizon oil spill. 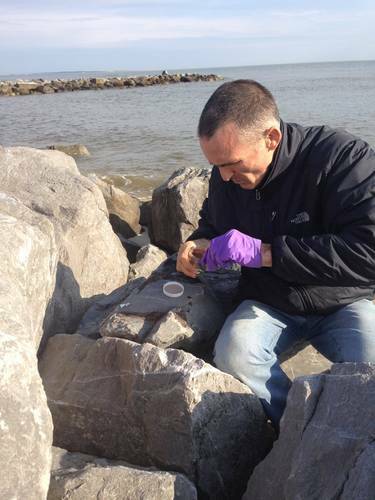 They were also trained in sample collection and scientific observation techniques such as how to properly document, photograph, and record observations in the field that they will apply to the collection of the reddish-brown oiled sand patties. 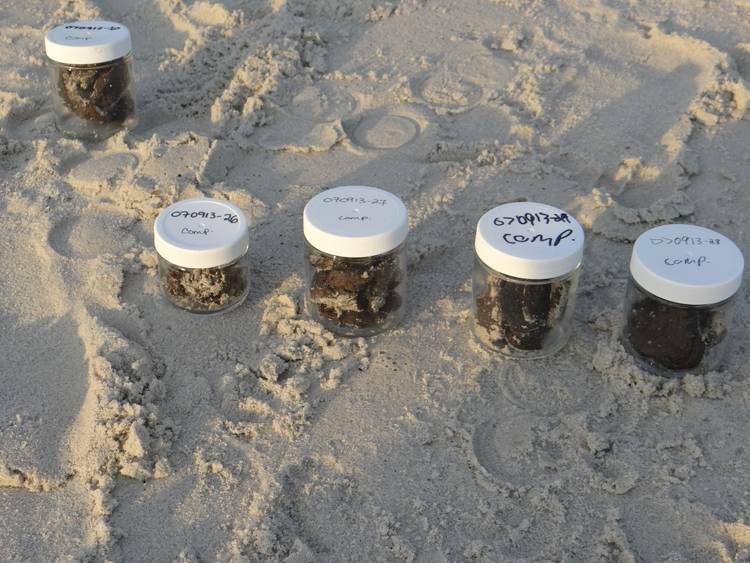 The samples collected during the GOO field study will be sent to WHOI for analysis in order to determine what they are comprised of and if they contain oil from the Deepwater Horizon spill. Through the on-line database, GOO volunteers will be able to track the results of their samples while Deep‐C scientists can use the data to further their research efforts. "Working outdoors on a beach is a great way to get young scientists out of the classroom and into the field where they often develop a strong bond to the work. And when they know they are participating in something more than just another homework assignment, there is considerably more buy-in," said Reddy. He and Carmichael gave a guest presentation about their research and their careers to this group of Honors Marine Science students in December. "The high school students bring a refreshing perspective that supercharges me," said Reddy. While in the field this week, the students will learn and apply the scientific method and process as part of this on-going research into the effects of crude oil on the environment funded by a grant from the BP/Gulf of Mexico Research Initiative (GoMRI). "The Gulf Oil Observers project was designed to allow students to share in the excitement of scientific discovery," said Chassignet. Thus far, Reddy’s research has yielded groundbreaking results. One such finding is that more oil than expected was weathered by a process called oxidation through exposure to sunlight and oil-eating microbes. The scientists have also found that the subtle changes in a compound’s shape or size can affect the rate it biodegrades. This discovery can be applied to the development of new industrial compounds that can quickly break down or last longer when released into the environment. In April 2010, the Deepwater Horizon drilling rig released an estimated 4.9 million barrels of crude oil into the Gulf of Mexico from a damaged well about 40 miles southeast of the Louisiana coast. Following the disaster, BP made a commitment to grant $500 million over 10 years to fund an independent research program designed to study the impact of the oil spill on the environment and public health in the Gulf of Mexico. "Never in the history of oil spill science has this research been funded so well with the decade-long effort from BP through GoMRI. Having 10 years for scientists to develop new techniques and insights will inevitably lead to advancements in this area of research," said Reddy.